Coconut sugar makes this Naturally Sweetened Peanut Brittle recipe intensely flavorful and much healthier! Despite this sugar’s name, coconut sugar does not taste or smell like coconut, but instead has a lovely brown sugar taste and appearance. It is sometimes called "coconut palm sugar," but do not confuse that with plain "palm sugar," which is a different product. Be sure to use real maple syrup, instead of maple-flavored "pancake syrup," which will not work in the recipe. 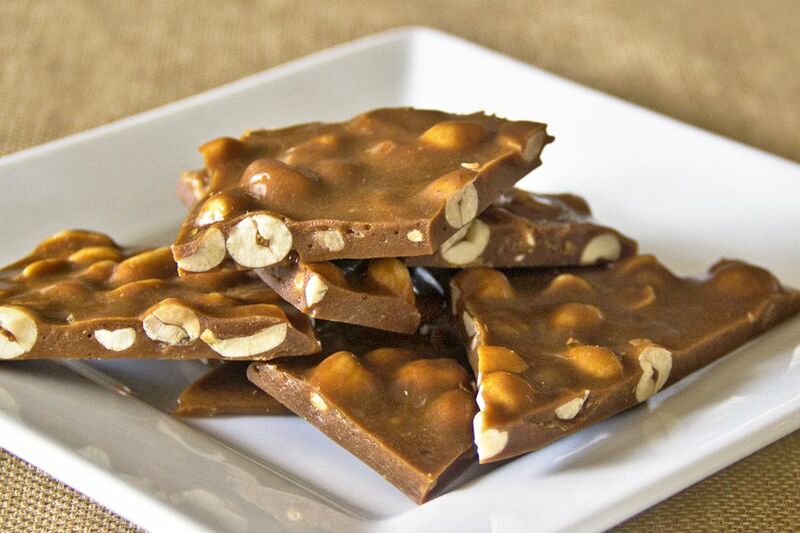 By using real peanut butter, this brittle also doesn’t contain any added butter or fat. Try substituting in other nuts or nut butters for a similar tasty treat. Place out all of the ingredients for ready use. In a medium saucepan, combine the coconut sugar, maple syrup, and water. Bring to a boil over medium heat. Add the salt, then insert a candy thermometer. Cook the brittle without stirring until it reaches 250 degrees Fahrenheit (121 C). Add the peanuts and stir them into the mixture. Continue cooking the candy until it reaches 290 degrees Fahrenheit (143 C). The peanuts will start to smell roasted and the caramelized scent will begin to be more robust. When it reaches this stage, turn off the heat and add the peanut butter. Stir quickly to combine and remove from the heat. Add the baking soda and vanilla and stir well—the brittle will foam up. Spread the candy out onto a parchment-lined baking sheet, to about ¼ inch thick. Spread quickly because this candy cools quickly! Place the mixture in the fridge to cool and set for 30 minutes.